After completing his PhD at the University of Missouri, Columbia, and a teaching stint at Monmouth College in Illinois, Ron Zank has returned to the University of Nebraska-Omaha as an assistant professor of theater. 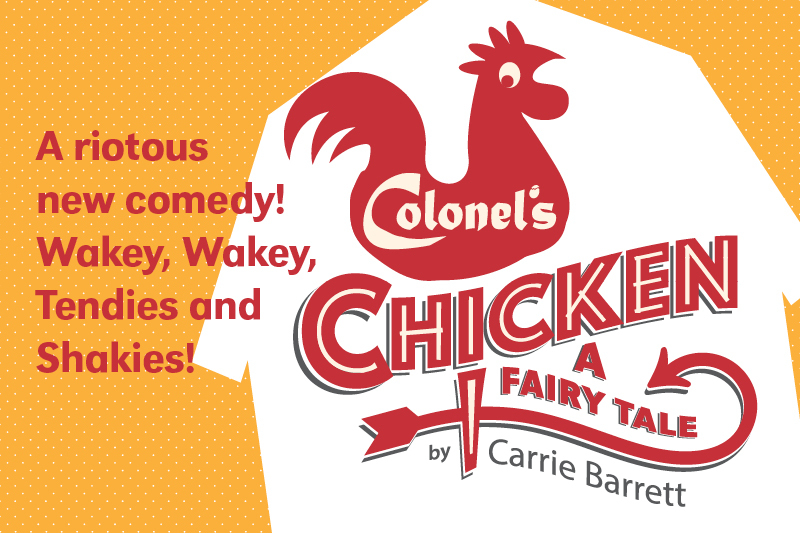 His directorial debut as faculty will be “Colonel’s Chicken: A Fairy Tale” by Carrie Barrett. The production is the first for the UNO Theatre Department’s Connections Series. According to Zank, the concept behind the new series is to do a collaborative production each season with another local arts organization. This season’s collaboration is with the Great Plains Theatre Conference, which produced a staged reading of the play in 2018. Fellow professor D. Scott Glasser directed the reading and recommended it for the series. From this nugget, playwright Carrie Barrett has fashioned “a comedy with a dark underbelly, a comedy about depression,” according to Zank. Demi wanders into a Colonel’s Chicken restaurant, looking for easy comfort after being dumped by her boyfriend. She strikes up a conversation with a giant chicken tender and is invited to join him in a special land just beyond the “Employees Only” door. Suddenly Demi is off to a Chick-Fil-Oz, a world with a Pepsi-blue sky, mashed potato mountains and a somewhat dark and creepy Colonel (not, Zank assures me, Colonel Sanders). The creator of this hero’s journey is playwright Carrie Barrett. Her plays have been produced or developed around the country, including the National Playwrights Conference at the Eugene O’Neill Theatre Center, Lincoln Center Director’s Lab. She has written sketch comedy for the Hollywood Improv and Second City Chicago. She also has a recurring role as the daffy news anchor, Mary Gaperman, on Nickelodeon’s Henry Danger. Despite a hectic schedule, Barrett hopes to make it to Omaha to see the production. Omaha theater is a better place with Ron Zank in it. Chick out his latest offering at UNO in February. “Colonel’s Chicken: A Fairy Tale” by Carrie Barrett will run at the Weber Fine Arts Building on the campus of UNO, 6001 Dodge Street, from February 20-23, 27-28 and March 1-2 . Curtain for all shows is at 7:30. There will be a TAG Nite Out on Wednesday, February 20. Remember to bring your TAG membership card—you will need it for the TAG Nite Out. Ticket prices are $16, and are available online at the UNO Theatre Box office or on line at https://www.unomaha.edu/college-of-communication-fine-arts-and-media/theatre. All major credit cards are accepted. Questions? Call the box office at (402) 554-PLAY (7529).